In order to achieve an iOS jailbreak of any kind, holes in the software must be found and exploited, and for the most part, there’s a requirement of several exploits working in tandem. 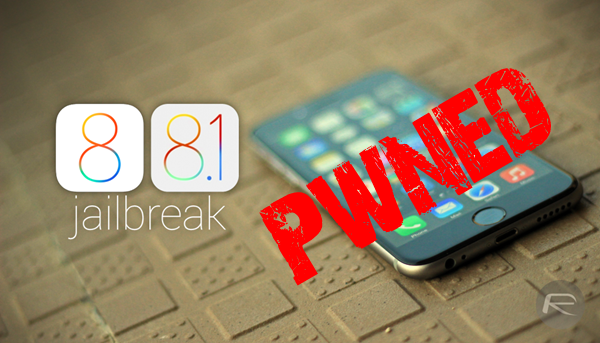 The Pangu8 jailbreak for iOS 8 / 8.1 utilized a multitude of security lapses in allowing us to reach the holy grail of Cydia once more, but while Apple just recently plugged three gaps in iOS 8.1.1 that had made Pangu8 possible, the Chinese hackers behind it have been given their due credits for discovering the flaws. Right from the first iOS 8.1.1 beta, we knew that Pangu8 for iOS 8 / 8.1 was coming to an abrupt end, and now the software has reached the end user, anybody updating will unfortunately not be able to jailbreak at this moment in time. As mentioned in previous coverage on the matter, the best position to be in as of now is running iOS 8.1, the most recent jailbreakable build, which gives you the opportunity to run Pangu8 at any time. For the most part, iOS 8.1.1 isn’t a spectacular update, and doesn’t really include much aside from a spate of bug fixes and general performance tweaks. But the three security patches outlined in a document accompanying iOS 8.1.1’s roll out do, at least, credit the Pangu team, and let’s hope those behind what remains an epic jailbreak continue to look for new ways to break into the walled garden that is iOS. 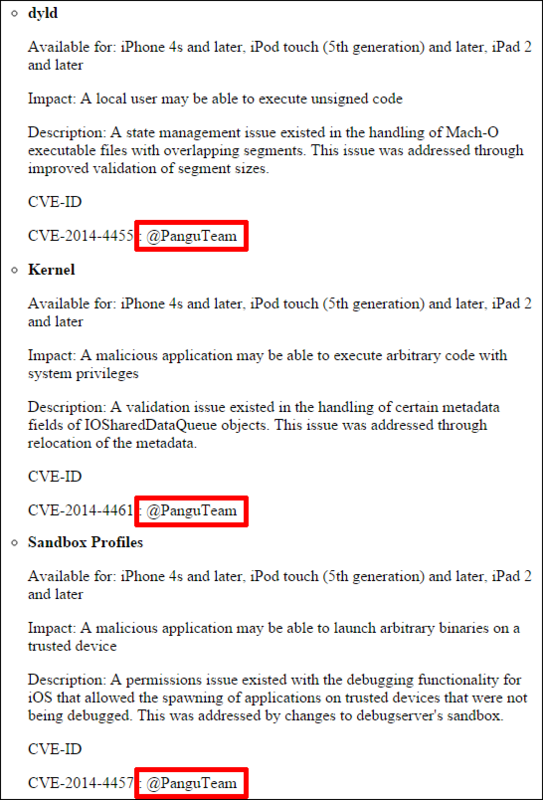 As for the three security lapses, one dyld, one kernel, and the other sandbox, they all had a role to play in Pangu8. The dyld issue, for example, enables a local user to "execute unsigned code," which many local users – i.e. jailbroken iOS device owners – have been doing for the past month or so. The kernel and sandbox flaws both open the gate for malicious apps to launch arbitrary code / binaries throughout the software, and so whilst it’s disappointing that the jailbreak is no more, you can certainly see and understand why Apple needed to tighten things up so quickly. Whether there’ll be another jailbreak on iOS is anybody’s guess. Often, hackers come through with one major untethered jailbreak per iOS release, but with iOS 8.2 and 8.3 in the pipeline, perhaps we’ll be treated to more on this occasion. Obviously, jailbreaks are by no means an entitlement, so we’ll wait in hope, but should anything intriguing come to light with regards to a future jailbreak, we’ll let you guys know right away. How do I downgrade to 7.1.2? Help, I need my phone jailbroken for my jihad custom apps. All new devices from the iPhone 4s can’t be downgraded. I think IOS should have a “developer mode” to allow for jail-breaking, developing and any other customizing a device owner may want. Simply put, if I’m responsible and self insured, I should have root-access, period. I noticed yesterday that iOS 8.1.1 was released. Been waiting for an iPhone Plus to come in stock and I lucked out big time!!! My local AT&T store had one left and it had iOS 8.1 out of the box!!! I’m so happy I got it when I did!!! I have to put out a big THANK YOU to Redmondpie for keeping us up to date on the latest iOS releases from Apple!! Happy Jailbroken iPhone 6 Plus owner!! and apple calls ki best display??????? iPhone Allah Jihad Akhbaaba. I need new jailbreak now, or we invade the west and unplug all servers. Then no more updates…ever. My iphone 5 has 7.1.2 on it. if i update to 8.1.1 and then run the ipsw restore to 8.1 file, will it be able to downgrade to 8.1 even though 8.1 was not previously on my device? You still need to do a full restore in iTunes to 8.1 in order to jailbreak. The way it comes from the factory is NOT sufficient enough to jailbreak. Just a heads up! Apple’s still signing 8.1 at the time of this writing. Completely irrelevant to the article guy…. The ISIS daily app has been updated with support for iOS8. No need for downgrading. Now please get these damn warheads and chemicals out of my study room, Achmed! NOW!